So far, one aspect of circuits that has surprised is how complicated they can be for seemingly simple programs. 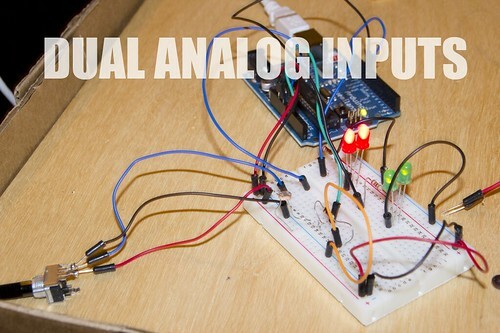 Take for example how straightfoward a potentiometer with one LED is, while how more intricate an analog circuit is with two LED’s and two analog inputs running in parallel. The println and serial monitor is especially useful, shedding light on the electrons as they shuttle through the circuit. They are busy bees. Soldering the potentiometer went surprisingly well! The last time i tried to melt metal, i burned myself when i didnt keep an eye on where put down the iron. to make sure i would not burn down the house or singe my carpet, i took an old ikea lack side table that we haven’t used in years. to keep all those small parts and my project over the week in order, i put up a cardboard fence at the edge. Next up, i need a clip on lamp to make it easy to document on my new work bench. I played around with all my analog sensors, in a four light LED setup. Writing the code was at first tricky, but doing one sensor at a time made it easy to debug and then to read the values going through. I also figured out how to reverse what was “on” for the photocell; putting the sensor into darkness turns it on. It isnt very sensitive but is an easy way to show something has moved by the setup.